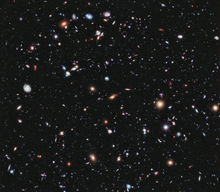 The original NASA release, containing galaxies of various ages, sizes, shapes, and colors. The smallest, reddest galaxies, of which there are approximately 10,000, are some of the most distant galaxies to have been imaged by an optical telescope, probably existing shortly after the Big Bang. The Hubble Ultra-Deep Field (HUDF) is an image of a small region of space in the constellation Fornax, containing an estimated 10,000 galaxies. The original release was combined from Hubble Space Telescope data accumulated over a period from September 24, 2003, through to January 16, 2004. Looking back approximately 13 billion years (between 400 and 800 million years after the Big Bang) it has been used to search for galaxies that existed at that time. The HUDF image was taken in a section of the sky with a low density of bright stars in the near-field, allowing much better viewing of dimmer, more distant objects. In August and September 2009, the HUDF field was observed at longer wavelengths (1.0 to 1.6 micrometers) using the infrared channel of the recently attached Wide Field Camera 3 (WFC3) instrument. When combined with existing HUDF data, astronomers were able to identify a new list of potentially very distant galaxies. Located southwest of Orion in the southern-hemisphere constellation Fornax, the rectangular image is 2.4 arcminutes to an edge, or 3.4 arcminutes diagonally. This is approximately one tenth of the angular diameter of a full moon viewed from Earth (which is less than 34 arcminutes), smaller than a 1 mm by 1 mm square of paper held at 1 meter away, and equal to roughly one twenty-six-millionth of the total area of the sky. The image is oriented so that the upper left corner points toward north (−46.4°) on the celestial sphere. On September 25, 2012, NASA released a further refined version of the Ultra-Deep Field dubbed the eXtreme Deep Field (XDF). The XDF reveals galaxies that span back 13.2 billion years in time, revealing a galaxy theorized to be formed only 450 million years after the big bang event. On June 3, 2014, NASA released the Hubble Ultra-Deep Field image composed of, for the first time, the full range of ultraviolet to near-infrared light. Diagram illustrating comparative sampling distance of the HUDF and the earlier Hubble Deep Field. In the years since the original Hubble Deep Field, the Hubble Deep Field South and the GOODS sample were analyzed, providing increased statistics at the high redshifts probed by the HDF. When the Advanced Camera for Surveys (ACS) detector was installed on the HST, it was realized that an ultra-deep field could observe galaxy formation out to even higher redshifts than had currently been observed, as well as providing more information about galaxy formation at intermediate redshifts (z~2). A workshop on how to best carry out surveys with the ACS was held at STScI in late 2002. At the workshop Massimo Stiavelli advocated an Ultra Deep Field as a way to study the objects responsible for the reionization of the Universe. Following the workshop, the STScI Director Steven Beckwith decided to devote 400 orbits of Director's Discretionary time to the UDF and appointed Stiavelli as the lead of the Home Team implementing the observations. Unlike the Deep Fields, the HUDF does not lie in Hubble's Continuous Viewing Zone (CVZ). The earlier observations, using the Wide Field and Planetary Camera 2 (WFPC2) camera, were able to take advantage of the increased observing time on these zones by using wavelengths with higher noise to observe at times when earthshine contaminated the observations; however ACS does not observe at these wavelengths, so the advantage was reduced. As with the earlier fields, this one was required to contain very little emission from our galaxy, with little Zodiacal dust. The field was also required to be in a range of declinations such that it could be observed both by southern hemisphere instruments, such as the Atacama Large Millimeter Array, and northern hemisphere ones, such as those located on Hawaii. It was ultimately decided to observe a section of the Chandra Deep Field South, due to existing deep X-ray observations from Chandra X-ray Observatory and two interesting objects already observed in the GOODS sample at the same location: a redshift 5.8 galaxy and a supernova. The coordinates of the field are right ascension 3h 32m 39.0s, declination −27° 47′ 29.1″ (J2000). The field is 200 arcseconds to a side, with a total area of 11 square arcminutes, and lies in the constellation of Fornax. Four filters were used on the ACS, centered on 435, 606, 775 and 850 nm, with exposure times set to give equal sensitivity in all filters. These wavelength ranges match those used by the GOODS sample, allowing direct comparison between the two. As with the Deep Fields, the HUDF used Directors Discretionary Time. In order to get the best resolution possible, the observations were dithered by pointing the telescope at slightly different positions for each exposure—a process trialled with the Hubble Deep Field—so that the final image has a higher resolution than the pixels on their own would normally allow. The observations were done in two sessions, from September 23 to October 28, 2003, and December 4, 2003, to January 15, 2004. The total exposure time is just under 1 million seconds, from 400 orbits, with a typical exposure time of 1200 seconds. In total, 800 ACS exposures were taken over the course of 11.3 days, 2 every orbit, and NICMOS observed for 4.5 days. All the individual ACS exposures were processed and combined by Anton Koekemoer into a single set of scientifically useful images, each with a total exposure time ranging from 134,900 seconds to 347,100 seconds. To observe the whole sky to the same sensitivity, the HST would need to observe continuously for a million years. Observations made of the HUDF with ACS. The sensitivity of the ACS limits its capability of detecting galaxies at high redshift to about 6. The deep NICMOS fields obtained in parallel to the ACS images could in principle be used to detect galaxies at redshift 7 or higher but they were lacking visible band images of similar depth. These are necessary to identify high redshift objects as they should not be seen in the visible bands. In order to obtain deep visible exposures on top of the NICMOS parallel fields a follow-up program, HUDF05, was approved and granted 204 orbits to observe the two parallel fields (GO-10632). The orientation of the HST was chosen so that further NICMOS parallel images would fall on top of the main UDF field. The field imaged by the ACS contains over 10,000 objects, the majority of which are galaxies, many at redshifts greater than 3, and some that probably have redshifts between 6 and 7. The NICMOS measurements may have discovered galaxies at redshifts up to 12. The HUDF has revealed high rates of star formation during the very early stages of galaxy formation, within a billion years after the Big Bang. It has also enabled improved characterization of the distribution of galaxies, their numbers, sizes and luminosities at different epochs, aiding investigation into the evolution of galaxies. Galaxies at high redshifts have been confirmed to be smaller and less symmetrical than ones at lower redshifts, illuminating the rapid evolution of galaxies in the first couple of billion years after the Big Bang. The Hubble eXtreme Deep Field (HXDF), released on September 25, 2012, is an image of a portion of space in the center of the Hubble Ultra Deep Field image. Representing a total of two million seconds (approximately 23 days) of exposure time collected over 10 years, the image covers an area of 2.3 arcminutes by 2 arcminutes, or approximately 80% of the area of the HUDF. This represents approximately one thirty-two millionth of the sky. The HXDF contains approximately 5,500 galaxies, the oldest of which are seen as they were 13.2 billion years ago. The faintest galaxies are one ten-billionth the brightness of what the human eye can see. The red galaxies in the image are the remnants of galaxies after major collisions during their elderly years. Many of the smaller galaxies in the image are very young galaxies that eventually developed into major galaxies, similar to the Milky Way and other galaxies in our galactic neighborhood. HXDF image shows mature galaxies in the foreground plane, nearly mature galaxies from 5 to 9 billion years ago, and protogalaxies beyond 9 billion years. Video (02:42) about how the Hubble eXtreme Deep Field image was made. ^ a b "IAC PRESS RELEASE - Making the Hubble's deepest images even deeper". Instituto de Astrofísica de Canarias. January 24, 2019. ^ "HubbleSite: News - Hubble's Deepest View of Universe Unveils Never-Before-Seen Galaxies". hubblesite.org. ^ "HubbleSite: Categories - news". hubblesite.org. ^ a b "Hubble Goes to the eXtreme to Assemble Farthest-Ever View of the Universe". NASA. 25 September 2012. Retrieved 26 September 2012. ^ "Instituto de Astrofísica de Canarias - IAC - Educational Outreach". www.iac.es. January 24, 2019. Retrieved 2019-02-05. ^ Martínez-Lombilla, Cristina; Akhlaghi, Mohammad; Cardiel, Nicolás; Dorta, Antonio; Cebrián, María; Gómez-Guijarro, Carlos; Almagro, Rodrigo Takuro Sato Martín de; Lumbreras-Calle, Alejandro; Infante-Sáinz, Raúl (2019-01-01). "The missing light of the Hubble Ultra Deep Field". Astronomy & Astrophysics. 621: A133. doi:10.1051/0004-6361/201834312. ISSN 0004-6361. ^ Borlaff, Alejandro; Trujillo, Ignacio; Román, Javier; Beckman, John E.; Eliche-Moral, M. Carmen; Infante-Sáinz, Raúl; Lumbreras, Alejandro; de Almagro, Rodrigo Takuro Sato Martín; Gómez-Guijarro, Carlos (January 2019). "The missing light of the Hubble Ultra Deep Field". Astronomy & Astrophysics. 621: A133. doi:10.1051/0004-6361/201834312. ISSN 0004-6361. ^ a b c d e f g h i j Beckwith, S.V. ; et al. (2006). "The Hubble Ultra Deep Field". Astronomical Journal. 132 (5): 1729–1755. arXiv:astro-ph/0607632. Bibcode:2006AJ....132.1729B. doi:10.1086/507302. ^ M. Stiavelli; S.M. Fall; N. Panagia. "Observable Properties of Cosmological Reionization Sources". Astrophysical Journal. 600: 508–519. arXiv:astro-ph/0309835. Bibcode:2004ApJ...600..508S. doi:10.1086/380110. ^ a b c d "Hubble's Deepest View Ever of the Universe Unveils Earliest Galaxies" (Press release). NASA. March 9, 2004. Retrieved 2008-12-27. ^ Bouwens, R.J.; et al. (2009). "Discovery of z~8 Galaxies in the HUDF from ultra-deep WFC3/IR Observations". The Astrophysical Journal. 709: L133–L137. arXiv:0909.1803. Bibcode:2010ApJ...709L.133B. doi:10.1088/2041-8205/709/2/L133. ^ Malhotra, Sangeeta. "As far as the Hubble can see" (PDF). Arizona State University. Retrieved 2010-10-28. ^ "Highlight HUDF Center at 3 32 39.0 -27 47 29.1". Wikisky. Retrieved 2010-10-28. Wikimedia Commons has media related to Hubble Ultra Deep Field. Wikimedia Commons has media related to Hubble eXtreme Deep Field.